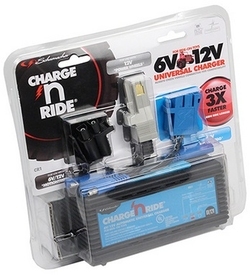 Schumacher's CR1 Charge 'n Ride is a universal 3 ampere automatic charger for battery powered ride-on toys. 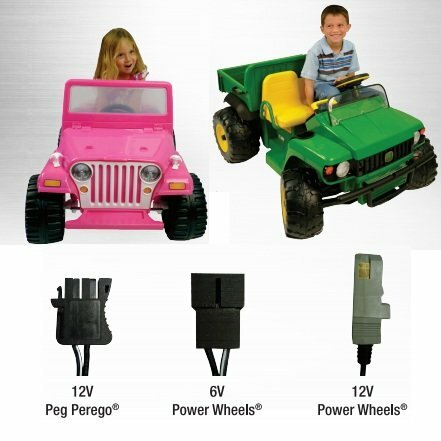 This charger is compatible with most 6 or 12 Volt Peg Perego, Power Wheels, Razor, and Schumacher batteries . Fully Automatic operation switches from continuous charge to float-mode monitoring. LEDs indicate battery status - charging, charged and check battery. Includes a versatile quick disconnect harness with 3 different connectors. Auto Voltage Detection automatically determines whether the connected battery is a 6 or 12 Volt battery. With the 3 ampere Charge 'n Ride, you can charge 3 times faster and ride longer. The CR1 from Schumacher Electric is a universal battery charger for battery-powered ride-on toys. The CR1 is compatible with most batteries for 3- and 4-wheel powered ride-on toys, with fully automatic operation that switches from continuous charge to float-mode. Monitoring LEDs indicate battery status, including Power, Charging, and Charged. The versatile quick disconnect harness features 3 different connectors. Reverse hook-up protection protects your child's toys from improper charging damage, and Auto Voltage Detection lets the charger automatically determine whether the connected battery is a 6V battery or a 12V battery. Microprocessor Controlled Technology with multi-stage charging lets the CR1 deliver added precision, safety, and battery life. This technology lets you charge your child's ride-on toys up to 3x faster, allowing children to spend more time with their toys and less time waiting on a lengthy charge. The CR1's Auto Voltage Detection automatically selects battery voltage (6V or 12V) and charges properly depending on the type of battery connected. The CR1 automatically switches from Continuous Charge to Float-Mode Monitoring, which allows the charger to maintain the battery when fully charged. The CR1 resumes continuous charging when the battery becomes discharged. LED lights on the CR1 indicate the connected battery's status, including Charging, Charged, and Check Battery. The versatile quick-connect harness allows you to attach any three connectors into place in seconds, with reverse hook-up protection that helps protect battery and charger from damage. The harness comes with three connectors designed to fit most models of Peg Perego and Power Wheels ride-on toys. The Schumacher CR1 charger is compatible with most Power Wheels, Peg Perego, and Schumacher batteries for 3- and 4- wheel powered ride-on toys.